I’m doing something super special this week! A week-long blog series on different variations of Dollar Store Pumpkins. Sorta like "Shark Week" only with Pumpkins. With the exception of Tuesday, (which will feature the You’re Gonna Love It Linky Party), EVERY DAY this week I am going to share a new way of transforming dollar store pumpkins, so they don’t look like Cheeto-orange styrofoam fake pumpkins. 6 different styles in 6 days. 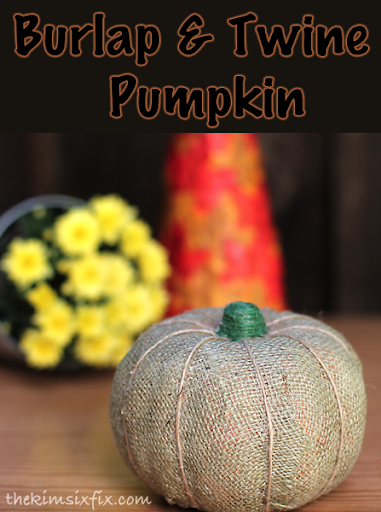 The first version I wanted to make was a burlap wrapped pumpkin (since isn’t everything better with burlap?) I originally saw this version at Hobby Lobby but i didn’t love the weird ruffle thing on the top. Plus I didn’t love the price tag.. more than $20! WHA?! I decided to Mod Podge the burlap on, instead of just wrapping or tying it because I wanted the shape of the pumpkin to be really obvious. Okay this has got to be on the most disgusting looking photos I have eve posted on my blog.. eewww. Come back on Wednesday for the next version! And don’t forget to swing by tomorrow and link up at the PARTAAAY!